Upstart is a peer-to-peer lending service that connects investors to borrowers. It is unique from many similar services in that it looks at far more than just credit history when approving borrowers. Their borrowers also tend to be younger, such as those who are recently graduated from college, or are just starting out in their careers. While all loans with Upstart are referred to as personal loans, those loans can be used for business purposes, and many borrowers have done just that. Upstart was founded by ex-Google employees, and to celebrate its roots, it also approves loans for students who want to pay tuition to attend partnered coding boot camps. Upstart focuses on lending money to recent or soon-to-be college graduates. While they do expect borrowers to have a relatively high credit score, they also consider things like GPA and SAT scores when grading a borrower. There is no minimum requirement for income or credit history length, so those students who haven’t had a chance to build a credit history yet have a much higher chance of getting a loan through Upstart. Payments on an Upstart loan are reported to credit agencies, so it can help build a credit history for borrowers very quickly. And one way that Upstart shines in comparison to other peer-to-peer services is that checking your eligibility and potential interest rates on an Upstart loan doesn’t hurt your credit. The loans offered by Upstart are between $1,000 and $50,000; come with an APR between 4.66% and 29.99% (which is significantly lower than many other similar services). Upstart loans are usually for a three-year time period, and also carry a one to seven percent origination fee. Because the length of the loan is so short, the payments can be higher than borrowers realize. While the approval process may take some time, due to the many different ways Upstart assesses potential borrowers, the loan process is very fast. Many times, money is transferred within 24 hours. There is an automated payment service available, and Upstart charges no fees for paying off your loan early. Additionally, their customer service is available every day, for extended hours that make it easy for borrowers and lenders to get in touch if they need to. 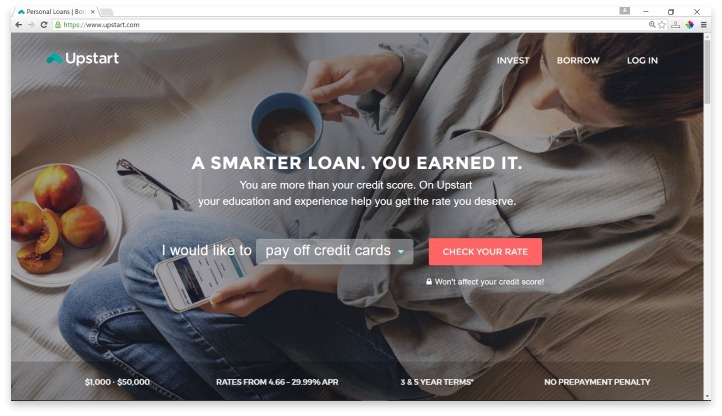 Upstart focuses on lending money to recent or soon-to-be college graduates. While they do expect borrowers to have a relatively high credit score, they also consider things like GPA and SAT scores when grading a borrower. Upstart’s loan range and fees are comparable across many other peer-to-peer lending services. Their lower interest rate, and their ability to work with those who have a less than perfect credit history, makes them a worthwhile lender to check out. College graduates and those just starting out in their careers especially can benefit from the way Upstart approves borrowers. Those who want to build credit will also be happy to know that their credit won’t be hurt by looking into Upstart’s services, the way it can be by applying to many other lending companies. If you are in need of a loan, have the ability to handle high monthly payments, and want to help build a bare or lackluster credit history, Upstart is a great option overall. Have you had an experience with this company? Please share your Upstart reviews below.